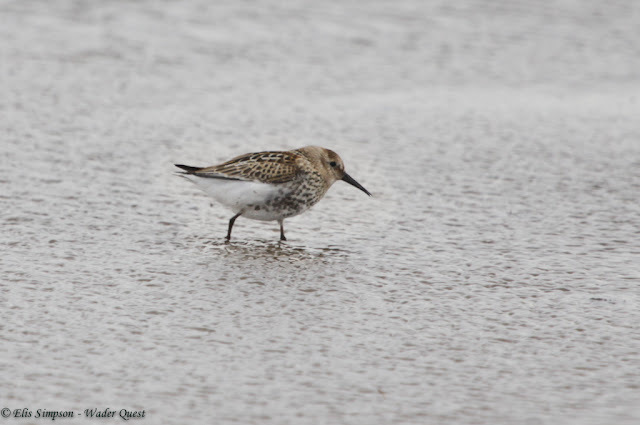 When it comes to scarce and rare wader sightings there is one county that crops up time and time again, and it was a county we had never visited; Northumberland. 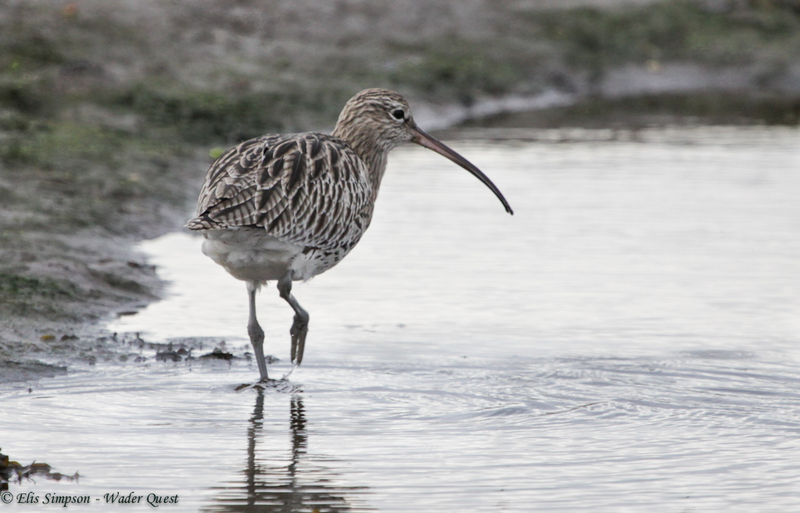 There have been many rare waders found over the years between June 2015 and July 2017 in some well known spots. Specifically there have been several Pectoral Sandpipers, a Long-billed Dowitcher that remained at Cresswell Pond NWT for some time in 2015; a Terek Sandpiper in July 2015 at Low Newton-by-the-sea; a White-rumped Sandpiper at Bamburgh in October 2015 and another at Amble in August 2016; same month a Spotted Sandpiper at Hauxley Nature Reserve; a Lesser Yellowlegs at Beal September 2016; a Baird's Sandpiper at Boulmer (pronounced boomer locally) in October 2016; and the same month an American Golden Plover at Low Newton-by-the-sea; and Long billed Dowitcher, again at Boulmer, in July 2017. 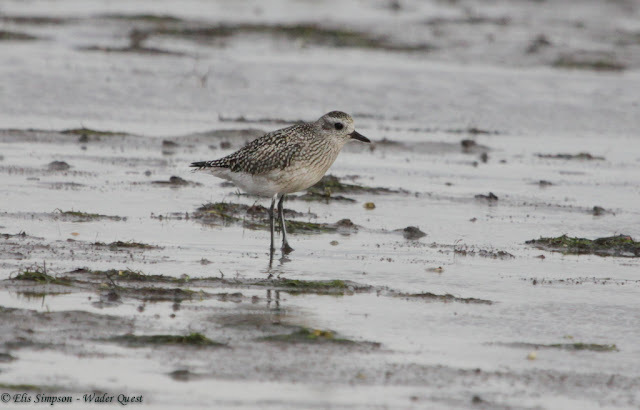 Along with all these goodies and places such as Druridge Pools and Budle Bay there is a plethora of other interesting scarce and passage waders such as Dotterel, Spotted Redshanks, Wood Sandpiper, Eurasian Whimbrel, Jack Snipe, Little and Temminck's Stint, Curlew and Purple Sandpiper plus Red-necked and Grey Phalaropes providing us with much enticement to visit the Northumberland Coast; so we did. 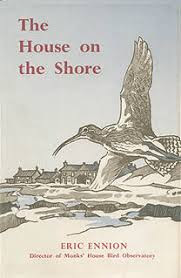 We stationed ourselves at a comfortable rented house with a sea view in Newbiggin-by-the-sea from where saw seven wader species; Grey Plover, Common Redshank, Eurasian Curlew, Eurasian Oystercatcher, Ruddy Turnstone, Dunlin and Sanderling, and set forth from there to visit just some of the wonderful sounding places about which we had heard so much. We enjoyed our little tour of the north-east coast very much. We were lucky to bump into a Barred Warbler on our first morning at Druridge Bay and we also had the pleasure of meeting local birder and Friend of Wader Quest Tom Cadwallander whom we met at Hauxley NR and with whom we then visited Alnmouth, also meeting his wife Muriel. They were very helpful in suggesting places to visit. Hauxley Nature Reserve is a great place to visit, not least because of the Red Squirrels that can be seen at the feeders. They have a new visitor centre that was built largely by volunteers after the original was burned down in an arson attack. There is a large pool over which you can watch from the café with a cuppa and some cake or a scone. 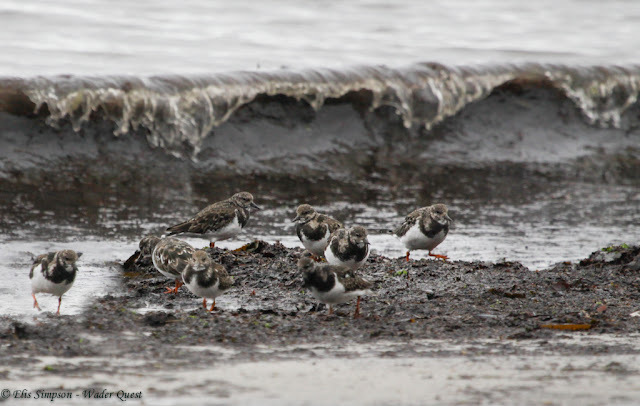 The shore itself is reached down a short avenue of bushes and trees and is great for waders. 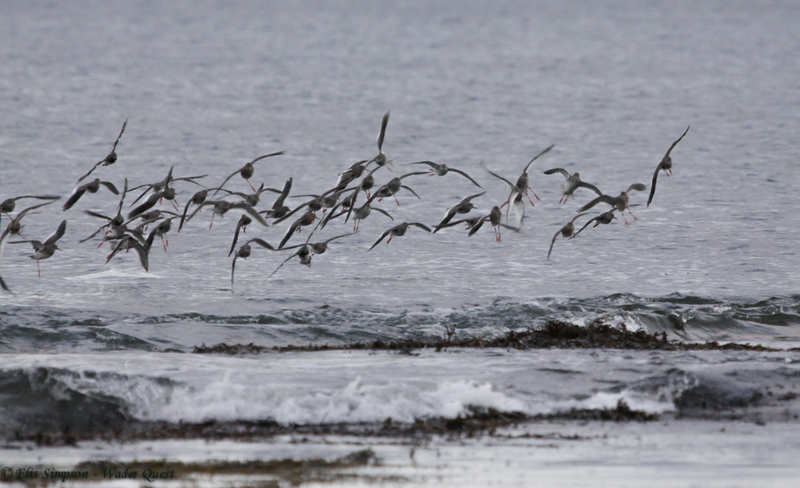 There we came across these two flagged birds originating from Norway where they hatched only this year. Bar-tailed Godwit yellow flag NHA ringed 29.09.2017, Revtangen Klepp, Rogaland, Norway. 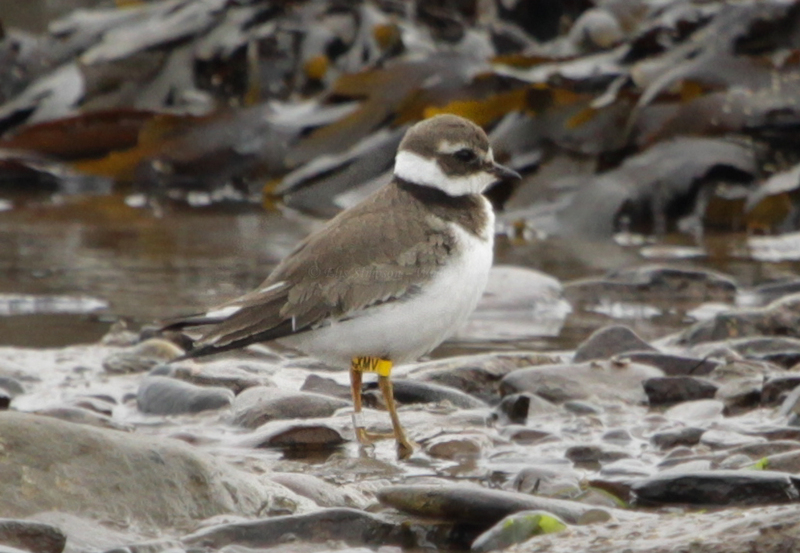 Common Ringed Plover yellow flag XMV ringed 23.09.2017 Makkevika (Giske Ornithological Station), Giske, Møre & Romsdal, Norway. 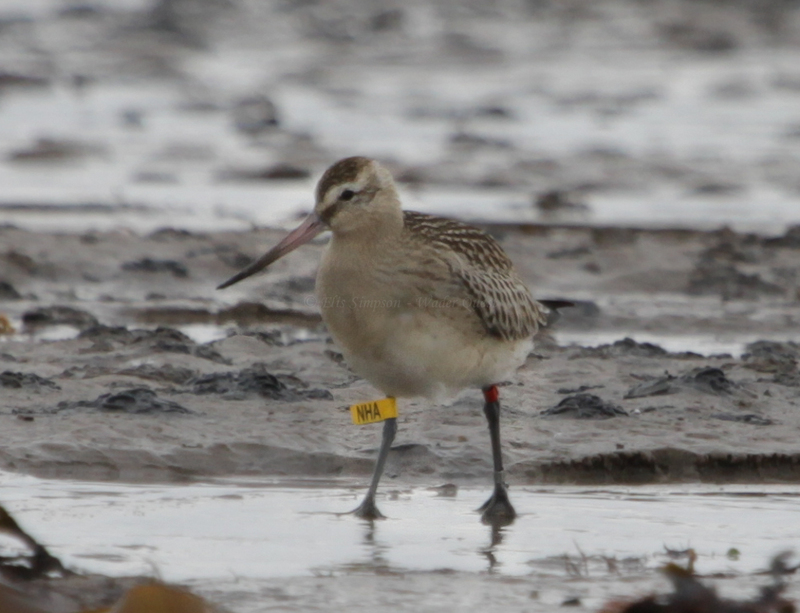 Generally the waders we saw were, for the most part, not particularly scarce. 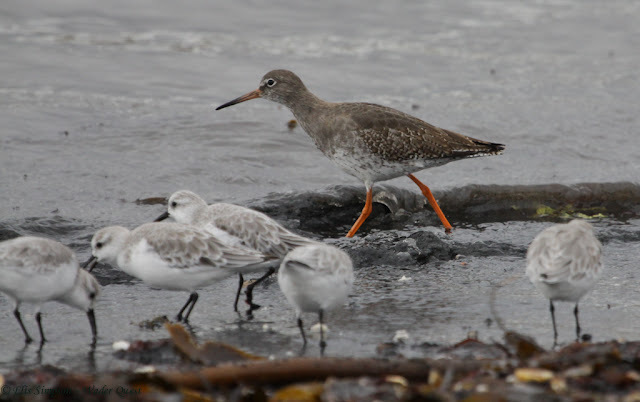 There were Common Redshanks everywhere along the coast and some were rather more approachable than those sentinels of the marsh that live on the saltings it seems. Common Redshanks and RuddyTurnstones at Newbiggin. 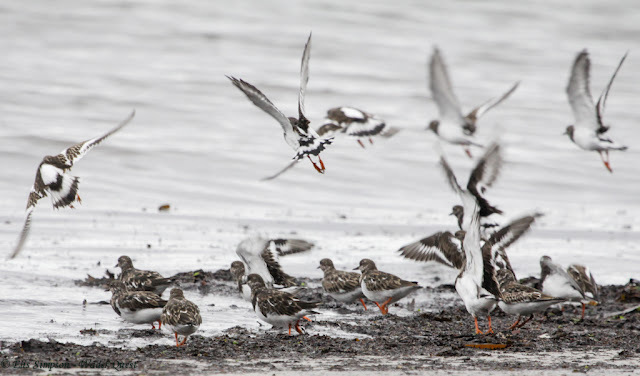 Perhaps the sloppiest and most disorganised inspiration of waders ever! What a mess! 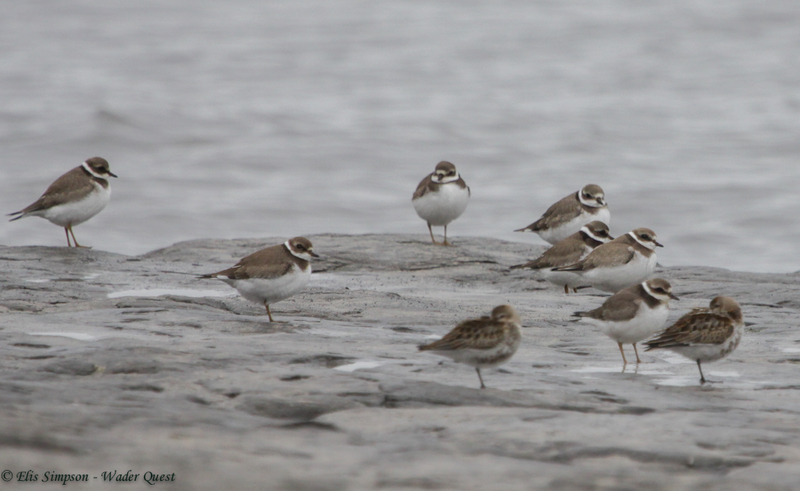 Resting Common Ringed Plovers and Dunlin at Berwick on Tweed. 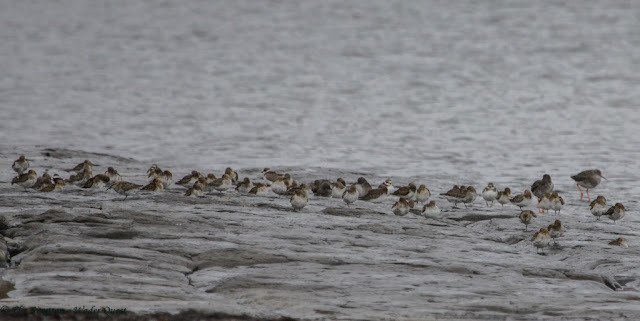 One of these roosting plovers was another Norwegian flagged bird, also a first year bird. 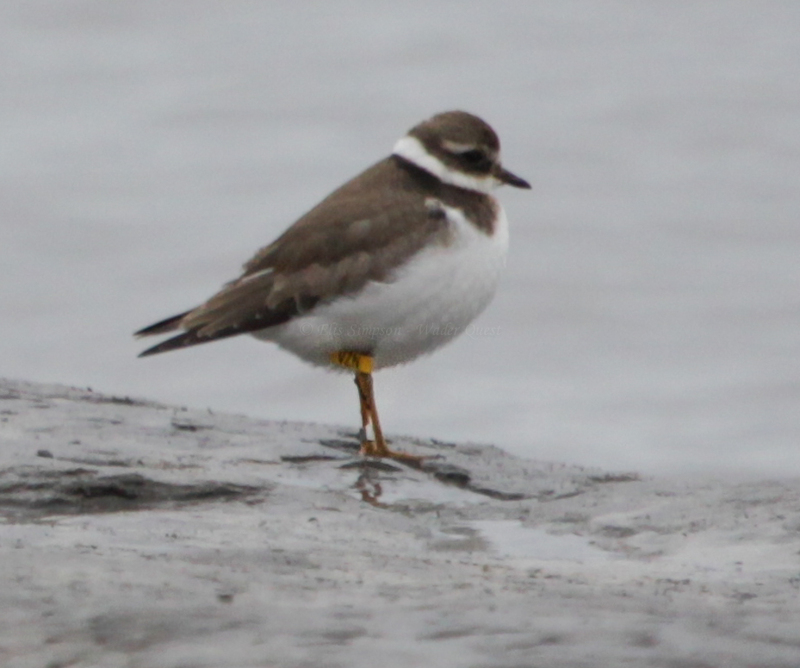 Common Ringed Plover yellow flag VZN ringed 13.09.2017 Makkevika (Giske Ornithological Station), Giske, Møre & Romsdal, Norway. 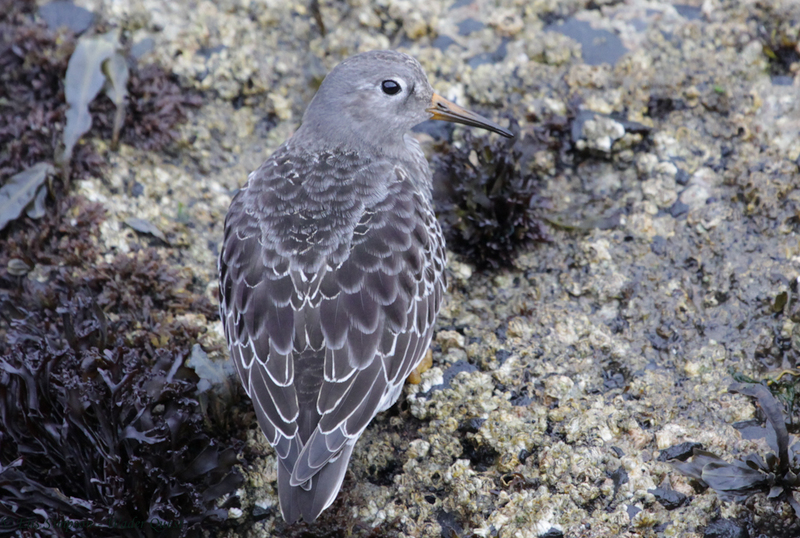 One of the highlights for us was seeing a single Purple Sandpiper at Amble, this being one of our favourite waders. 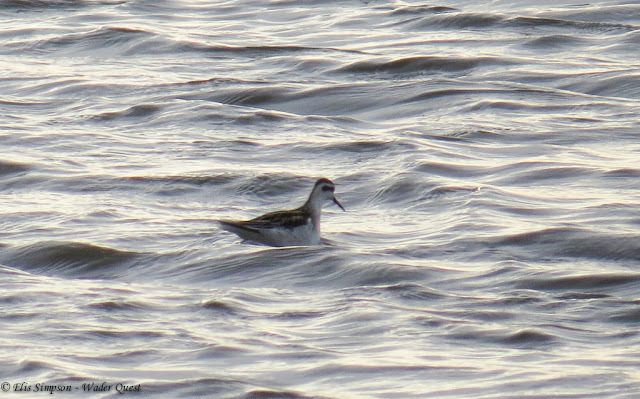 The cherry on the cake however, Northumberland living up to its reputation for attracting good waders, was this Red-necked Phalarope that turned up at Druridge pools during our visit. Then there is Monks' House. This is the famous Bird Observatory that was set up and run by the legendary Eric Ennion. It is no longer an observatory more's the pity, but we felt we had to pay homage to it as it has such a lot of wader history associated with it; not least as it was where none other than Clive Minton became inspired by waders. We stopped for a look and decided that this was exactly the sort of place that Wader Quest should have as a base... anyone want to buy it for us? This visit was made even more enjoyable by the fact that we had been to the famous Barter Books shop at Alnwick (pronounced annick - they don't go in for pronouncing their Ls much up there is seems) and in return for some old books we had taken with us we were able to bring home some lovely old tomes including The House on the Shore about Monks' House by Eric Ennion; I spent most evenings immersed in this fascinating window into a section our birding history. If there was one thing that left a blot on the landscape, so to speak, it was the inevitable off leash dog walkers. There was not one single beach that we visited where our enjoyment of the birds was not tainted by the birds being chased off by a dog. On one occasion at Berwick I had been patiently sitting quietly on a large rock waiting for a group of Ruddy Turnstones to work their way towards me, enjoying their bulldosing tactics in the beached seaweed. They were down to about three metres when some oaf and his hound walked between me and them, the dog chasing the Turnstones which left in panic, he surely could not have failed to see me looking through my binoculars at the birds in addition to which there was at least 30 metres of beach behind me where he could have passed instead. Panic! The result of the approaching dog and walker. He then marched along the beach and reaching the spot where Elis was photographing the roosting Common Ringer Plovers and Dunlins, flung his ball right in among them scattering them to all quarters. The roosting birds moments before the ball landed among them. Previously resting birds now using precious energy unnecessarily. I find it hard to believe that this was lack of awareness, this appeared to be out and out bloody mindedness. He then sat on the rocks to which the birds were trying to return and phoned someone on his mobile while his dog careered into the sea after a swan. However, despite these niggles, we had a wonderful time overall and enjoyed some remarkable moments with the birds; one such example was on some of the pull-offs on the causeway to Holy Island. 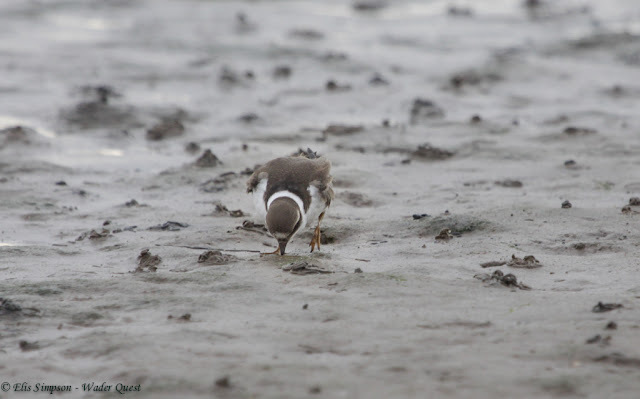 There, it is possible, with a bit of patience, to get quite good views of the birds if the tide is not too far out when the birds become widely scattered and distant. Grey Plover from the Holy Island causeway. Eurasian Curlew from the Holy Island causeway. 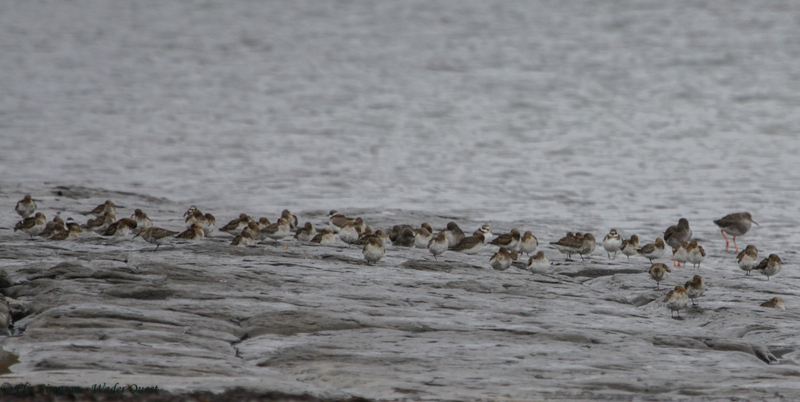 Dunlin from the Holy Island causeway. Common Ringed Plover from the Holy Island causeway. We can't wait to return to Nothumberland some day in the near future to see more of the lovely county and its exciting birds and met more of the friendly birders.